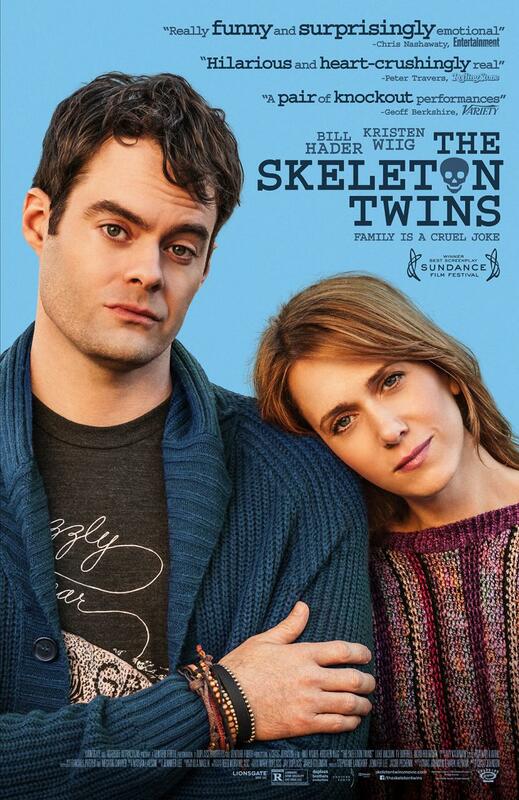 I was tired of all the happy, sunshiny movies, so today I saw “The Skeleton Twins.” I know that tragedy plus time is comedy, but the most important thing is the, uh, I guess it would be: timing. Milo (Bill Hader from “22 Jump Street“) is depressed and suffering from life so he decides to put an end to it – his life, that is. Fortunately, in Los Angeles the neighbors are nosy and they find him before it is too late. At the same time in New York, his sister Maggie (Kristin Wig from “The Secret Life of Walter Mitty”) is about to swallow a fistful of pills when she gets the call about her brother. She has not spoken to Milo for 10 years, but she flies to LA to be there for him. Maggie brings him back to New York for a while until he “gets better.” Milo gets to meet her husband of two years, Lance (Luke Wilson from “Death at a Funeral“), and examine her seemingly perfect life. While we all know she is not happy, it takes a while for Milo to catch on. Still, he has his own issues that are not going away. When we meet their mother (Joanna Gleason from “Last Vegas”), we learn a little bit more and all I can say about their father is that he is not around anymore. There is plenty of smart writing in this movie, and great performances by two leads who are comfortable in their own character’s crazy skin. I don’t think they set out to entertain me, or make me laugh or show me something clever, but it happened. I learned something about the human condition and how family is the best and worst thing we have. That reminds me – I need to call my sister. If all this strife and struggle are too much for you, Maggie and Milo do a song from Jefferson Starship that is worth the price of admission. For that, I must give this movie 4 stars out of 5. See it with someone who will talk you down off the ledge. I had no idea which way “The Maze Runner” was going to take me. Now that I’ve made it through, I would like to know who moved my cheese doodles. In a world where the Earth gives birth to a brand new teenager once a month via an elevator box, Thomas (Dylan O’Brien from “The Internship”) arrives in the glade. His first instinct is to run, as he does not know where he is or who he is. Alby (Ami Ameen from “The Butler”) was the first one up, and for three years the box has arrived with supplies and a new boy to whom Alby has to explain he has no explanation. 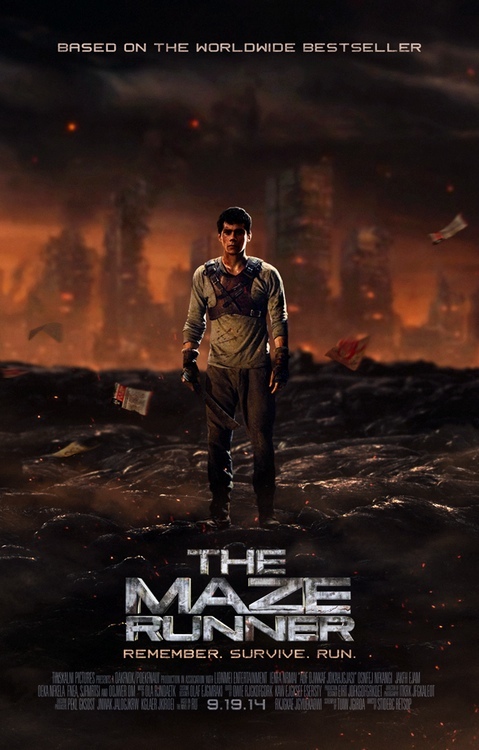 They know nothing of their past or why they are chosen, but Alby thinks the only way out is through the Maze. This was a wonderful setup, with no backstory or even an idea of what planet they are on or who is pulling the strings on the box. There was a whole “Lord of the Flies” thing going on, though Alby keeps them organized and focused on seeking a way out. Every morning the Maze opens and runners are sent in to map the Maze and chart all its configurations as it changes every day. I heard the Maze itself was designed based upon the Affordable Health Care website. This movie was a mix of mystery and horror and science fiction. That made it another kind of maze for Wes Ball, who was directing his first feature film. I liked the way he kept it a small story in the middle of something big – whatever that was. If you could just get through the maze you would know. I got through the movie, and I will give it 3 ½ stars out of 5. Maybe now we can find out who is behind the curtain, I mean the Maze. John Galt (Kristoffer Polaha from “Back in the Day“) used to work in an automotive plant until the company changed the rules and decided to pay each employee based upon his needs instead of what he produced. He said, “No.” No to the company and the country that wanted to exploit his talent and hard work instead of reward it. Soon many other captains of industry disappeared to escape the crusade against the accomplished. They also said no to the government whose regulations strangled their prosperity. While Dagny decides whether she will join Galt, her precious railroad company is taken over by the government with her incompetent brother at the controls. To say the movie is preachy is to not understand the sermon that was Ayn Rand’s life work. The format of this final installment played like a newsreel, serving the filmmaker and author’s intent to reveal the societal crime of excessive regulation as the break on man’s engine of ingenuity. While this movie served my flavor of Kool-Aid, the pace and production quality played like a TV movie. For decades this was to be a mini-series, and perhaps those fingerprints couldn’t be removed. It didn’t help that this third installment had the third cast, as all the leads were recast over the three years it took to do three movies. So, this is the third actress to play Dagny. One thing that spiced this movie up was the cameos of current pundits beating the drum against the growth of government as the private sector is described as a bunch of selfish greedy capitalist. Rand may have written the book 57 years ago but she looks like a prophet to me now. With a third of the country on food stamps and the generators of wealth vilified as the top 1 percent who must give it up to the other 99 percent I now see why Atlas shrugged. This movie will be studied in the future to help understand Rand’s principles and how not to turn a thousand-page novel into a movie. I do think this movie has the bulk of the “truth” in it and can almost stand alone, though I wonder if Rand would have allowed that. I am willing to make allowances and I give this movie 3 stars out of 5. 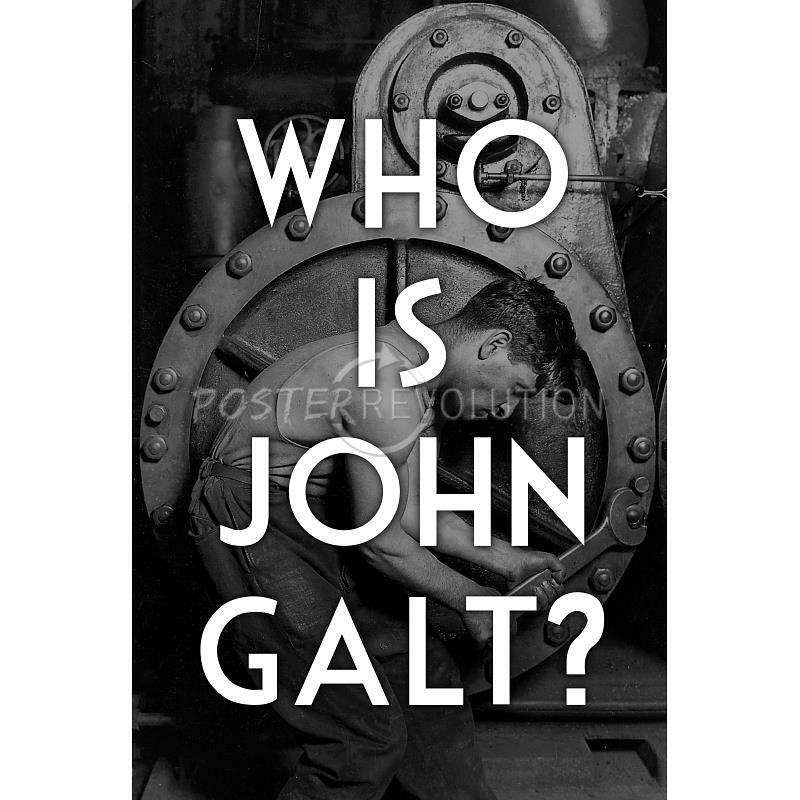 Now that I know who John Galt is I wish I could find him. 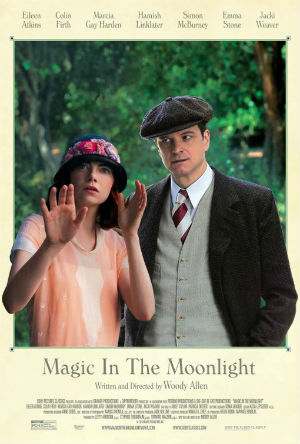 If you are looking for “Magic in the Moonlight” I have found it. You don’t have to believe in magic to appreciate this movie; you just need to have faith in Woody Allen movies. Stanley (Colin Firth from “The Railway Man“) is a world-renowned magician, although he performs as an old Chinese man. This deception allows him to have a simple and practical private life. In his spare time, Stanley debunks would-be mystics and psychics. Everything he does in his act is a trick designed to fool people, but these charlatans who think they can talk to the spirit world turn people into fools. His best friend, Howard (Simon McBurney from “Tinker Tailor Soldier Spy”), asks him to unmask a young American woman who he is convinced has supernatural powers. When Stanley meets young Sophie (Emma Stone from “The Amazing Spiderman”), he resists her beauty and gentle nature and digs in for the inquisition. Over the next few days she peppers him with bits from his life that make him start to believe that she may be the real thing. But he does not believe in the real thing – or anything he can’t understand. Firth and Stone work well together with his proper British gentleman bit and her aloof and coy glances. Add in Director Woody Allen’s (“Blue Jasmine”) standard 30-year difference in their ages and his method of stuttering and bumbling into a love affair and it’s all rather charming. When Stanley embraces the possibilities of a spirit world, so many more things seem possible in his life. He finds there is a difference between contentment and happiness. Believing in things you don’t understand is a requirement to be in love. Logic has no place in such things, though Stanley has not given up those tools. There are some other great actors in the movie, but the focus is kept on the leads. While I would normally consider this an asset, it leaves many of the other talented people on screen as mere props to the simple construct of the story. I admit this movie was fun and annoyed me less than most Woody Allen movies. For that reason I must give this movie 3 ½ stars out of 5. There is a little magic here if you believe in that kind of thing… or if you just like Woody Allen movies.